125 other birds have this item in their bag or wishlist! 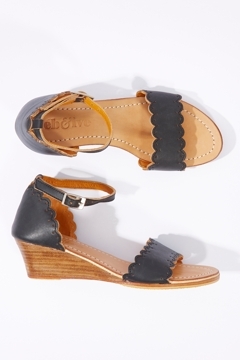 The Cacada Leather Wedge from Eb & Ive features dainty punch leatherwork with a scallop edge and practical wedge heel. I love the look but on the small side - can't be bothered to return so hope they soften up and expand a bit. Very comfy. I am in between sizes (38-39) and kept the 39. Great wedge height & cute cut out pattern detail across the top of foot. A go to little shoe. I ended buying both the black and caramel colours in these shoes. I have narrow feet, and find it really hard to find sandals that fit well sometimes, but I couldn't believe my luck when I found these beauties! They are perfect on my feet, comfortable too! I am usually size 39-40 in shoes. I have wide feet and the strap across the toes of this shoe is a very tight fit. Sadly I am returning them. Love these wedges and are very comfortable to wear all day. I noticed that after wearing for the first time the heels have already worn down and will have to be repaired. Originally ordered size 39 but returned for a size 40 as they run on the small size. Absolutely love these shoes, so much so that I think I'll get the black too! My feet are really narrow, which makes finding shoes that fit difficult at times, but these fit perfectly! I've already worn them out and I know they're going to become a staple in my wardrobe. Thanks Birdsnest!